How to force my Galaxy Note5 to reboot when screen is frozen or the device is locked up? Warning: Do not attempt to remove the battery from your device. Doing so may damage the device and battery and could cause burning and injury. Important: Ensure your device is charged to a minimum of 5%. If your battery is below 5%, the device may not turn on after the restart. A device that is completely drained should be charged for a minimum of 15 minutes using the wall charger supplied with your device. Galaxy Note5: How do I remove the S Pen and configure S Pen settings? Galaxy Note5: How do I insert the SIM card into my Samsung Galaxy Note5? 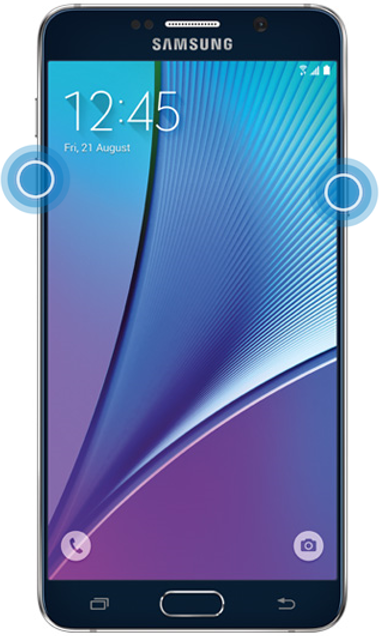 Galaxy Note5: How do I activate and use Air View feature on my Samsung Galaxy Note5?